It’s a particularly happy Tuesday today because I have a stunning perfume to share with you, and also one to give away! Woo hoo! Versace Eros Pour Femme has just launched in House of Fraser yesterday, and I was literally like a kid in a candy shop when the sample arrived with me last week. Just look at the bottle! 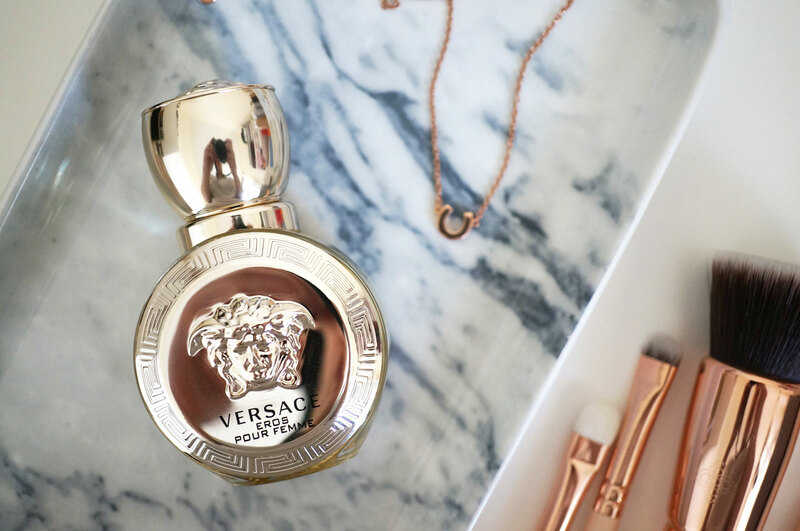 I don’t think I’ve ever seen a perfume bottle as beautiful as this – featuring Versace’s signature Medusa head in relief and a Greek key motif around the edges, this stunning high shine bottle would just look gorgeous on any dressing table. So what’s the fragrance about? Well the Eros fragrance is nothing new. The mens’ version has been around since 2012, and finally Versace has got around to launching the new Eros Pour Femme. If you’re not into Greek mythology, Eros is actually the God of love, ‘…and the goal of the Eros Pour Femme campaign was to present that Eros was seduced and to suggest the strength of a woman’ stated Donatella Versace. The faces of the campaign are Brian Shimansky and the gorgeous Lara Stone – what a beaut! Well it smells gorgeous! Eros Pour Femme includes top notes of lemon, bergamot and pomegranate, middle notes of jasmine, peony and lemon flower, and base notes of ambrox, sandalwood and musk. It opens with beautiful and bright Sicilian lemon, Calabrian bergamot and pomegranate accords, with a heart of lemon, sambac jasmine absolute, jasmine infusion and velvety peony. The base incorporates sandalwood, mysterious ambrox, musk and various sensuous woody notes. I love this perfume, it’s definitely one I’ll be purchasing again and again. Versce Eros Femme is currently available from House of Fraser starting at £50.00. What a beautiful bottle that is, would love to try it. What a beautiful bottle – this looks gorgeous! Possibly one of the best perfume bottles I’ve seen. My mum collects all the bottles that stand out like this or something like the couture edition of Valentine Rock n Rose so should I win I think I’ll just give it as a Mothers day gift. 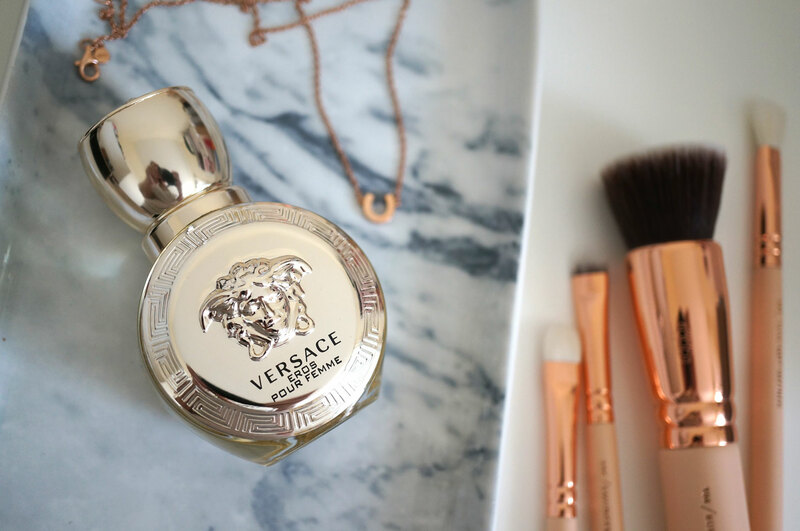 Great giveaway – I love Versace perfume! Looking for a new perfume – mine no longer easily available. Wonder if this could be it? This is crazy. I literally just came home from a day out with my best friend and I tried this perfume on and told her “I NEED THIS IN MY LIFE”. Great giveaway, I need a new perfume! I’m really curious for this fragrance. Thanks! This perfume looks so good! I’ve never tried it before but I LOVE perfumes, I drive my boyfriend mad by spending ages in Debenhams smelling them so this would have pride of place on my perfume shelf! I’ve never tried a Versace perfume but it looks fab! The bottle is really pretty! It has a vintage feel to it. Thanks for the chance.